Belgium's forward Eden Hazard (right) shoots and scores a goal. 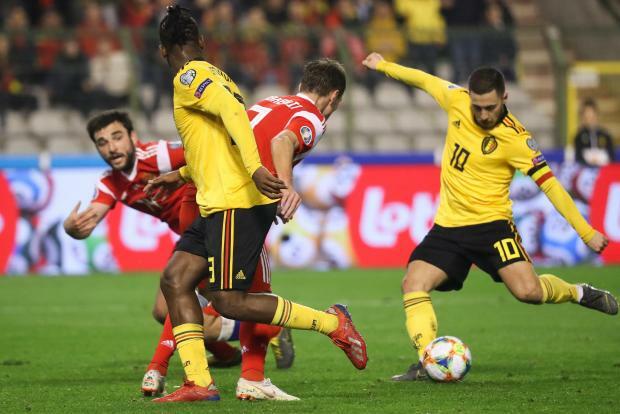 Eden Hazard ensured Belgium kicked off their qualifying campaign for Euro 2020 on Thursday with a brace in a home victory over Russia. World Cup semi-finalists Belgium earned a battling 3-1 win over Russia in Brussels as Hazard struck twice for Roberto Martinez's side in their opening game in Group I.
Krzysztof Piatek continued his magnificent season with the only goal in a 1-0 win for Poland away to Austria in Group G.
The Milan forward, already with 19 goals in 27 Serie A appearances this term, has now scored twice in three outings for his country following his international debut in September.